Pros: this is an awesome piece!! nice heavy thick glass, it gives you an extra smooth cool smoke and feels your lungs to maximum capacity choking you out rip after rip.....thats if you can hang! Cons: the bowl is huge so you might want to purchase 1 or 2 other bowls to accomadate such a beast....there is some drag but this thing gets milky, your gonna have to exhale completely prior to taking a rip if you plan on trying to milk and clear this thing! 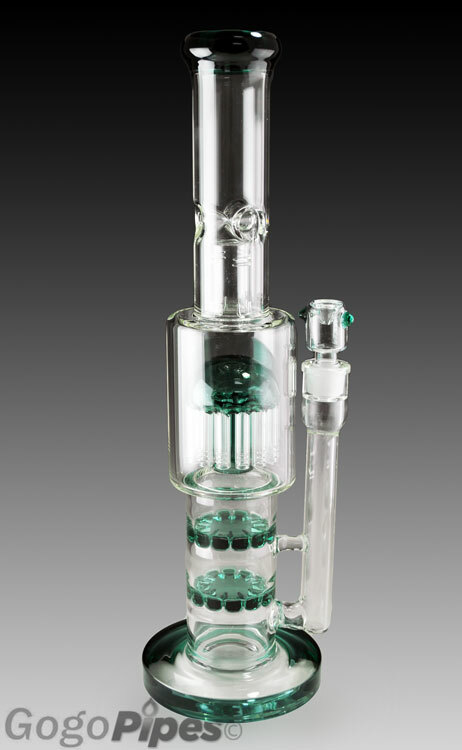 Pros: The neck of the pipe is made with really thick glass. It is reassuring and feels like it will protect the tree percs. It rips like a champ and definitely gives you a bang for your buck. Cons: The base of the pipe seems a thinner than the neck, yet is still decently thick. Since it is about 22 inches tall if you add an ash catcher you definitely need to take a breath before you clear it unless you have a massive lung capacity. Comments: Awesome piece and the shipping confirmation was great. Got here within a week. Thanks!